The company said the decision to use Lite OS was taken in part to maximise battery life. It marks a setback to Google’s Android-based Wear OS, which ran Huawei’s last two generations of smartwatches. The Chinese firm also unveiled a smartphone with a unique wireless power facility. The Mate 20 Pro can both be recharged without having to be plugged in, and wirelessly power other compatible devices in turn. Android dominates the smartphone market, accounting for about 85% of all shipped handsets, according to IDC. However, it’s dominance does not continue into smartwatches, the market research firm said. None of the five top-selling smartwatch brands currently use Wear OS and it is only installed on 10.3% of all smartwatches that were shipped within the July-to-September period in western Europe. Instead, Apple, Fitbit, Samsung and Garmin are among those to have adopted proprietary platforms. And now, Huawei is doing likewise for its Watch GT. Its operating system, Lite OS had previously been used by Huawei to power a more basic fitness tracker. In addition, it has been licensed by others to power smart doorbells, internet-connected letter boxes, street lamps and smart energy meters among other products. 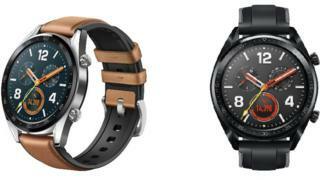 Huawei said one benefit of its move was to make use of Watch GT’s new “dual chipset architecture”. This provides a low-power-consumption section that is used for simple tasks including sleep analysis, and a more battery-hungry section for more complex activities such as providing sports coaching tips. The timepiece is compatible with both iOS and Android handsets. “Huawei has been very clear that it wants to compete more with Fitbits and Garmins than true smartwatches with their own [data] connectivity,” commented Marta Pinto from IDC. She added that providing more limited abilities than past models had also helped the firm sell it at a lower price. Smartwatch owners typically use fewer apps on any of the various platforms than had once been forecast. But one industry-watcher questioned whether Huawei’s device was too limited. “The battery life is massive, but will that make up for the lack of [the social fitness network] Strava on there?” asked David McQueen from the consultancy ABI. “You can’t even play music from it. It’s quite a dumbed down device. Unlike the firm’s recent P20 Pro, however, there is no dedicated monochrome camera as Huawei says it no longer needs one to enhance image detail. Business users are being targeted by the ability to wirelessly link the handsets to Bluetooth-enabled screens for presentations. And the Pro model offers both a fingerprint sensor beneath part of its screen as well as a depth-sensing facial scanner. Many of the details had leaked in advance. But the firm did have one major surprise: the Mate 20 X. The model has a 7.2in (18.3cm) display – bigger than some tablets – a companion stylus and a 5,000 mAh battery. “It’s expensive, but Huawei is pitching this to a niche market – the business sector – which is still growing, while the consumer smartphone market in Europe is declining,” commented Ms Pinto. Huawei overtook Apple to become the world’s second bestselling smartphone brand in the April-to-June quarter, behind Samsung. But it is as yet unclear whether the Shenzhen-based company can achieve its goal of selling more units than its Californian rival for 2018 as a whole. “Having a few useful differentiators to what else is on the market should help,” commented Mr McQueen.